The College Football Hall of Fame has announced the Finalists for their 2019 Ballot. As always, it is a long ballot and this year it consists of 76 players and six coaches from the Football Bowl Subdivision and 100 players and 32 coaches from the divisional level. Flozell Adams, Michigan State-Offensive Tackle - 1997 First Team All-American and Big Ten Offensive Lineman of the Year…Three-time All-Big Ten performer who helped Spartans to three consecutive bowl appearances… Helped running backs rush for more than 100 yards in 21 games throughout career and allowed only two QB sacks in 1997 season. Bernard Berrian, Fresno State-Kick Returner/Wide Receiver - 2001 First Team All-America kick returner who led the nation in all-purpose yards (2,776)…Bulldogs all-time leader in career all-purpose yards (5,828) and tied school records for career TD receptions (25)…Three-time All-WAC performer who helped team to a share of the 1999 WAC title. Michael Bishop, Kansas State-Quarterback - 1998 consensus First Team All-American and winner of the Davey O’Brien Award…1998 Heisman Trophy runner-up who led Cats to 1998 Big 12 North title and berth in conference championship…Set 14 conference and 34 school records while throwing for 2,844 yards and 23 TDs and rushing for 748 yards and 14 TDs in 1998 championship season. Lomas Brown, Florida-Offensive Tackle - 1984 consensus First Team All-American and two-time All-SEC performer…Led Gators to three consecutive bowl berths and top 10 national final rankings in 1983 and 1984…Recipient of Jacobs Blocking Trophy as the SEC’s top blocker in 1984. Terrell Buckley, Florida State-Defensive Back - 1991 unanimous First Team All-American and winner of the Thorpe Award…Led the nation in interceptions (12) and return yards (501) during final season at FSU…Seminoles’ all-time leader in career interceptions (21) who returned four interceptions and three punts for touchdowns in career. Brandon Burlsworth, Arkansas-Offensive Guard - 1998 First Team All-American and First Team All-SEC selection…Helped Arkansas to two postseason berths and to SEC Western Division titles in 1995 and ’98…Former walk-on who later started 34 consecutive games. Larry Burton, Purdue-Split End - First Team All-American and Outstanding College Athlete of America in 1974 and a First Team All-Big Ten selection…Led the team in receiving in both 1973 and 1974…Named team captain and team MVP in 1974. Keith Byars, Ohio State-Running Back - Unanimous First Team All-American and Heisman Trophy runner-up who led nation in rushing (1,764), all-purpose yards (2,441) and scoring (144) in 1984…1984 Big Ten MVP and two-time All-Big Ten selection…Ranks fifth all-time at OSU with 4,369 career all-purpose yards and 3,200 career rushing yards. Matt Cavanaugh, Pittsburgh-Quarterback - 1977 First Team All-American who led the Panthers to a 1976 national title…Led Pitt to three consecutive bowl wins, earning MVP honors in the 1977 Sugar and 1977 Gator bowls…Finished Pitt career ranked second all-time (behind only Tony Dorsett) with 3,916 career yards of total offense. Dallas Clark, Iowa-Tight End - 2002 unanimous First Team All-American and winner of the Mackey Award as the nation’s best tight end…Two-time All-Big Ten selection who helped Iowa to a share of the 2002 Big Ten title and its first-ever 11-win season (2002)…Holds record for longest pass reception in school history (95 yards). Marco Coleman, Georgia Tech-Linebacker - 1991 First Team All-America pick…Two-time First Team All-ACC, leading Jackets to the national championship and an 11-0-1 record in 1990…28 career sacks rank 14th all-time in ACC history. Tim Couch, Kentucky-Quarterback - 1998 consensus First Team All-American who finished fourth in Heisman voting in 1998 and ninth in 1997…1998 SEC Player of the Year who led Cats to first win over Alabama in 75 years…Set seven NCAA, 14 SEC and 26 school records. Eric Crouch, Nebraska-Quarterback - 2001 Heisman, Walter Camp and Davey O’Brien Award winner who led Huskers to 2001 national title game at the Rose Bowl…Finished career as NCAA record holder for career rushing TDs by a quarterback (59)…Led team to 42-9 record and four bowl berths. Eric Dickerson, Southern Methodist-Running Back - Named unanimous First Team All-American and finished third in the Heisman Trophy voting in 1982…Twice named SWC Player of the Year, he holds 14 SMU records including career rushing yards (4,450). Rickey Dixon, Oklahoma-Defensive Back - 1987 consensus First Team All-American and winner of the 1987 Thorpe Award…Two-time First Team All-Big Eight selection and member of 1985 National Championship team…Finished career as school leader in single-season interceptions (9) and ranked second all-time with 17 career interceptions. Vaughn Dunbar, Running Back-Indiana - 1991 unanimous First Team All-American who led the nation in rushing (1,805) and finished sixth in Heisman voting…1991 First Team All-Big Ten selection, leading the conference with 150.4 ypg…Team MVP posted consecutive 1,000-yard seasons and led the Hoosiers to two bowl games. Jumbo Elliott, Michigan-Offensive Tackle - Two-time First Team All-American (consensus-’87)… Two-time All-Big Ten First Team selection and member of 1986 Big Ten Co-Champions…Paved the way for Jamie Morris, who had three-straight 1,000-yard seasons. Bobby Engram, Wide Receiver-Penn State - 1994 First Team All-American and recipient of the Biletnikoff Award as the nation’s top receiver…Three-time First Team All-Big Ten selection who led Lions to the 1994 conference title and four bowl wins…First-ever PSU player to record a 1,000-yard receiving season and left PSU with 12 school records. Kevin Faulk, Louisiana State-Running Back - 1996 First Team All-American who finished career ranked fourth in NCAA history in all-purpose yards (6,833)…Three-time First Team All-SEC selection and 1995 SEC Freshman of the Year…Set 11 school records during career and became first LSU back to average 100 yards per game during entire career. David Fulcher, Arizona State-Defensive Back - Two-time First Team All-American, earning consensus honors in both 1984 and 1985…Three-time All-Pac-10 selection who led ASU to 1985 Holiday Bowl berth…Recorded 14 interceptions, returning one for a touchdown, and 286 tackles in career. Robert Gallery, Iowa-Offensive Tackle - 2003 consensus First Team All-American and recipient of the 2003 Outland Trophy…Two-time First Team All-Big Ten selection and Big Ten Offensive Lineman of the Year as a senior…Led Hawkeyes to a Big Ten title, Orange Bowl appearance and a No. 8 final ranking in 2002. Moe Gardner, Illinois-Defensive Tackle - Two-time First Team All-American (unanimous-‘89, consensus-’90)…1990 Big Ten Defensive Player of the Year and 1989 Big Ten Lineman of the Year…Three-time First Team All-Conference pick and set school record for career TFL (57). Tony Gonzalez, California-Tight End - 1996 consensus First Team All-American and First Team All-Pac-10 selection…Holds Cal record for receptions in a bowl game (9 in 1996 Aloha Bowl)…Posted 89 receptions for 1,302 yards and eight touchdowns during career. Jacob Green, Texas A&M-Defensive Lineman - 1979 First Team All-American and two-time All-SWC selection…Set A&M records for career sacks (37) and single-season sacks (20 in 1979)…Led Aggies to berths in the 1977 Bluebonnet and 1978 Hall of Fame bowls. Dan Hampton, Arkansas-Defensive Tackle - 1978 First Team All-American and two-time All-SWC selection…Named 1978 Houston PostOutstanding Player of the Year in the SWC, recording 18 TFL during his senior campaign…Helped Hogs beat No. 19 Georgia in 1976 Cotton Bowl and No. 2 Oklahoma in 1978 Orange Bowl. Jason Hanson, Washington State-Placekicker - Two-time First Team All-American, earning unanimous honors in 1989…Holds numerous NCAA, conference and school records, including longest field goal without a tee (62 yards) and career field goals of 40 yards or more (39)…Four-time All-Pac-10 selection and 1991 NFF National Scholar-Athlete. Byron Hanspard, Texas Tech-Running Back - 1996 unanimous First Team All-American and recipient of the Doak Walker Award…Tech’s all-time leader in rushing (4,219) who tied NCAA record by reaching 1,000-yard mark by fifth game of 1996 season…Three-time All-Big 12 selection, helping Red Raiders to first Cotton Bowl since 1938. Kevin Hardy, Illinois-Linebacker - 1995 consensus First Team All-American and Butkus Award winner…Two-time First Team All-Big Ten selection who helped Illini to two bowl berths…Team captain started 45 games (second all-time among LBs) and ranks fourth all-time at Illinois in sacks (18) and TFL (38). Marcus Harris, Wyoming-Wide Receiver - Two-time First Team All-American, earning consensus honors as a senior…1996 Biletnikoff Award winner who finished ninth in Heisman Trophy voting and twice led the nation in receiving yards per game…1996 WAC Offensive Co-Player of the Year who set NCAA record with 4,518 career receiving yards. Marvin Harrison, Syracuse-Kick Returner/Wide Receiver - 1995 First Team All-American as a kick returner and 1995 Big East Special Teams Player of the Year…Three-time All-Big East selection who set a conference record with a 94-yard punt return for a TD in 1995…Left Syracuse as the school’s all-time receiving leader (2,718 yards). Jeff Hartings, Penn State-Offensive Lineman - Two-time First Team All-American, earning consensus honors in 1995…Three-time First Team All-Big Ten selection who helped Lions to the 1994 conference title…Leader of an offensive unit that set 14 single-season school records and led the FBS in scoring (47.8 ppg) in 1994). E.J. Henderson, Maryland-Linebacker - Only two-time consensus First Team All-American in Terps history…2002 Bednarik and Butkus award winner who helped Maryland to an Orange Bowl berth and No. 11 final ranking…2001 ACC Player of the Year and two-time ACC Defensive Player of the Year, leading Terps to the 2001 ACC title. Craig Heyward, Pittsburgh-Running Back - 1987 consensus First Team All-American who led the nation in rushing his final season and finished fifth in Heisman voting…Left Pitt as the second-leading rusher in school history (behind only Tony Dorsett) with 3,086 career rushing yards…Rushed for at least 100 yards in every game of 1987 season. Torry Holt, North Carolina State-Wide Receiver - 1998 consensus First Team All-American who was the only receiver in the top 10 of the 1998 Heisman Trophy voting…1998 ACC Player of the Year who earned First Team All-Conference honors as a receiver and punt returner…NC State’s all-time leader in receiving (3,379) and all-purpose yards (1,979). Ken Huff, North Carolina-Offensive Guard - 1974 consensus First Team All-American who captained the College All-Stars vs. Super Bowl Champion Pittsburgh Steelers…First Team All-Conference and recipient of the 1974 Jacob’s Blocking Trophy as the ACC’s best offensive lineman…Third overall pick in the first round of the 1975 NFL draft and named an ACC Football Legend. Steve Hutchinson, Michigan-Offensive Lineman - 2000 unanimous First Team All-American who led the Wolverines to four bowl wins, including the 1997 National Championship at the Rose Bowl…One of only seven players in conference history to be named a four-time First Team All-Big Ten selection…Three-time Big Ten champion. Raghib Ismail, Notre Dame-Wide Receiver - Two-time First Team All-American earning consensus honors in 1989 and unanimous laurels in 1990…Walter Camp Player of the Year and Heisman Trophy runner-up in 1990…Led ND to national championship at the Fiesta Bowl and two Orange Bowls. Larry Jacobson, Nebraska-Defensive Tackle - 1971 consensus First Team All-American and Outland Trophy recipient…Led Huskers to back-to-back national titles and three-consecutive conference championships…1971 All-Big Eight performer who led Nebraska to a 33-2-1 record during career. E.J. Junior, Alabama-Defensive End - 1980 unanimous First Team All-American and member of two national championship teams (1978, 1979)…Three-time First Team All-SEC selection and 1980 SEC Lineman of the Year, who led Tide to two conference titles…Member of fabled goal-line stand defense vs. Penn State in 1979 Sugar Bowl. Jess Lewis, Oregon State-Defensive Tackle - Named First Team All-American in 1967…Played in the College All-Star Game, East-West Shrine Game and Coaches All-America Bowl in 1970…Two-time First Team All-Conference selection (1967, 1969). Ray Lewis, Miami (Fla.)-Linebacker - 1995 First Team All-American and Butkus Award runner-up…Led Canes to Fiesta and Orange bowl appearances and ranks sixth all-time at Miami with 388 career tackles…Two-time First Team All-Big East performer who twice led the league in tackles. Bobby Majors, Tennessee-Defensive Back - 1971 unanimous First Team All-American who led Vols to wins in 1971 Sugar Bowl and 1972 Liberty Bowl… Two-time First Team All-SEC selection still holds conference and school record with 10 INTs in 1971…Set Tennessee records for career punt returns (117) and career punt return yardage (1,163). Tony Mandarich, Michigan State-Offensive Tackle - 1988 consensus First Team All-America…Finished sixth in the Heisman Trophy voting in 1988…Helped the Spartans to three bowl game appearances and a victory in the 1987 Rose Bowl. Ed McCaffrey, Stanford-Wide Receiver - 1990 First Team All-American and two-time Stanford MVP…1990 First Team All-Pac-10 receiver who led the Cardinal in receiving yards three-of-four years…Ranks in the top 10 all-time at Stanford with 146 career receptions and 2,333 career receiving yards. Darren McFadden, Arkansas-Running Back - Two-time First Team All-American (2006-consensus, 2007-unanimous) and two-time Heisman Trophy runner-up…2007 Walter Camp Player of the Year and two-time Doak Walker Award recipient…Two-time SEC Offensive Player of the Year and the Hogs all-time rushing leader (4,590 yards). Cade McNown, UCLA-Quarterback - 1998 Consensus First Team All-American and Johnny Unitas Golden Arm Award recipient…1998 Pac-10 Co-Offensive Player of the Year who led UCLA to consecutive Pac-10 titles in 1997 (shared) and 1998…Holds numerous school records. Corey Moore, Virginia Tech-Defensive Lineman - Two-time First Team All-American (1999-unanimous) and winner of the 1999 Lombardi and Nagurski awards…Two-time Big East Defensive Player of the Year led Hokies to 2000 National Championship Game…Leader of Hokies famed “Lunch Pail Defense” that led the nation in rushing defense (85.0 ypg). Dan Morgan, Miami (Fla.)-Linebacker - 2000 unanimous First Team All-American and first player to sweep the Butkus, Bednarik and Nagurski awards in one season…2000 Big East Defensive Player of the Year and three-time First Team All-Big East selection…Canes all-time leader in tackles (532) who started a school-record 45 games. Ken Norton Jr., UCLA-Linebacker - 1987 First Team All-American, leading Bruins to four consecutive bowl wins… Member of the 1985 conference championship team… Led team in tackles in 1986 (106) and in 1987 (125) and ranks sixth in school history with 339 career tackles. Phil Olsen, Utah State-Defensive End - 1969 consensus First Team All-American…1969 team captain and Utah State Athlete of the Year…Selected to play in the East-West Shrine Game and the Hula Bowl…Brother of College Football Hall of Famer Merlin Olsen. Leslie O’Neal, Oklahoma State-Defensive Tackle - Two-time First Team All-American, earning unanimous honors in 1985…Three-time All-Big Eight selection and 1984 Big Eight Defensive Player of the Year, who led Pokes to three-straight bowl berths…Left OSU as school leader in career sacks (34), career TFL (47) and single-season sacks (16). Jim Otis, Ohio State-Fullback - Named consensus First Team All-American in 1969…Member of the 1968 National Championship team…Named First Team All-Big Ten conference in 1969 and led the Buckeyes to two conference titles…Led the team in rushing three times. Carson Palmer, Southern California-Quarterback - 2002 consensus First Team All-American and Heisman Trophy recipient…2002 Pac-10 Co-Offensive Player of the Year who set conference/school career records for total offense (11,621 yds) and passing yards (11,818)…Led USC to a share of the 2002 Pac-10 title and first 11-win season since 1979. Jake Plummer, Arizona State-Quarterback - 1996 First Team All-American and Pac-10 Player of the Year…Led 1996 team to an undefeated regular season and first Rose Bowl appearance since 1986…Four-year starter and two-time ASU MVP who threw for more than 2,000 yards in three consecutive seasons (8,827 career passing yards). Troy Polamalu, Southern California-Defensive Back - Two-time First Team All-American, earning consensus honors in 2002…Two-time First Team All-Pac-10 selection and finalist for the Thorpe Award as a senior…Two-year captain and 2001 USC MVP, who led Trojans to two bowl berths and a share of the 2002 Pac-10 title. David Pollack, Georgia-Defensive Lineman - Three-time First Team All-American (consensus in 2002, 2004) and recipient of the 2004 Lombardi and Bednarik awards…Two-time SEC Defensive Player of the Year who led Bulldogs to consecutive SEC title games…UGA’s all-time leader in sacks (36) and tackles for loss (58.5). Antwaan Randle El, Indiana-Quarterback - 2001 First Team All-American…First player in FBS history to pass for 6,000 yards and rush for 3,000 yards in career…Rushed for more yards than any QB in FBS history upon conclusion of career. Simeon Rice, Illinois-Linebacker - Two-time First Team All-American and three-time First Team All-Big Ten selection…Holds conference and school record for career sacks (44.5) and Illini record for career tackles for loss (69)…Set school record for single-season sacks (16). Ron Rivera, California-Linebacker - 1983 consensus First Team All-American…Lombardi Award finalist in 1983 and named East-West Shrine Game Most Valuable Player…Selected as Pac-10 Co-Defensive Player of the Year in 1983…Led team in tackles from 1981-83. Rashaan Salaam, Colorado-Tailback - 1994 unanimous First Team All-American and Heisman Trophy winner…1994 Walter Camp Player of the Year and Doak Walker Award recipient… 1994 Big Eight Offensive Player of the Year who led nation in rushing, scoring and all-purpose yards. Lucius Sanford, Georgia Tech-Linebacker - Named a First Team All-American in 1977…A three-time First Team All-Conference selection, he led Georgia Tech in tackles in 1975 (121) and 1976 (117)…Named to the Georgia Tech Hall of Fame and the school’s All-Time Team in 1991. Larry Seivers, Tennessee-Wide Receiver - Two-time consensus First Team All-American in 1975 and 1976…Two-time First Team All-SEC selection…Currently ranks sixth in Tennessee history in career reception yardage (1,924) and seventh in career receptions (117). Kenneth Sims, Texas-Defensive Tackle - Two-time First Team All-American (1980-consensus, 1981-unanimous) and recipient of the 1981 Lombardi Award…Finished eighth in 1981 Heisman Trophy voting and led Longhorns to four bowl berths…Two-time First Team All-SWC performer who ranks fourth in school history with 29 career sacks. Aaron Taylor, Notre Dame-Offensive Tackle - Two-time First Team All-American, earning consensus honors in ‘92 and unanimous in ’93… 1993 Lombardi Award winner and named College Interior Lineman of the Year by Touchdown Club of Columbus (Ohio)…Led Irish to four bowl games. Joe Thomas, Wisconsin-Offensive Lineman - 2006 unanimous First Team All-American and Outland Trophy recipient…2005 Second Team All-American and three-time All-Big Ten performer (First Team-2005, 2006)…2006 NFF National Scholar-Athlete who led Badgers to four bowl games and three top 20 finishes. Dennis Thurman, Southern California-Defensive Back - Two-time First Team All-American who led Trojans to four consecutive postseason wins, including the 1974 National Championship at the Rose Bowl…Two-time all-conference selection who helped USC to two Pac-10 titles. Troy Vincent, Wisconsin-Defensive Back - 1991 First Team All-American and runner-up for the 1991 Thorpe Award…Two-time All-Big Ten selection and 1991 Big Ten Co-Defensive Player of the Year…Finished career as Wisconsin’s leader in punt return yards (773) and passes defended (31). Chris Ward, Ohio State-Offensive Tackle - Two-time First Team All-American (consensus-‘76, unanimous-‘77)…Three-time First Team All-Big Ten selection who helped Buckeyes to at least a share of four conference titles…Blocked for Archie Griffin during second Heisman Trophy-winning campaign. Lorenzo White, Michigan State-Running Back - Two-time First Team All-American, earning unanimous (’85) and consensus (’87) honors…Led State to 1987 Big Ten title and Rose Bowl win…Led nation in rushing (1985), first MSU player to lead team in rushing four-straight seasons. Zach Wiegert, Nebraska-Offensive Tackle - 1994 unanimous First Team All-American and winner of the Outland Trophy…Led Huskers to 1994 National Championship and 1993 National Championship game appearance…Three-time All-Big Eight selection who led Nebraska to league titles every year of career. Patrick Willis, Mississippi-Linebacker - 2006 consensus First Team All-American and recipient of the 2006 Butkus Award, who led the nation in solo tackles (90) as a junior…2006 SEC Defensive Player of the Year and two-time First Team All-SEC selection, twice leading the league in tackles…Finished career ranked sixth all-time at Ole Miss with 355 career tackles. Al Wilson, Tennessee-Linebacker - 1998 consensus First Team All-American who led the Vols to the inaugural BCS national title in 1998…Helped Tennessee to four postseason berths and four AP top 10 finishes…Two-time All-SEC performer led Vols to consecutive SEC titles (1997, 1998) and only lost three conference games in career. Steve Wisniewski, Penn State-Offensive Guard - 1988 First Team All-American…Member of 1986 12-0 national championship team…Helped Blair Thomas rush for 1,414 yards and 11 touchdowns in 1987 and D.J. Dozier attain First Team All-America honors in 1986. Elmo Wright, Houston-Wide Receiver - 1970 consensus First Team All-American who earned Second Team honors in 1969 and Honorable Mention honors in 1968…Set an NCAA single-season record of eight TD receptions of 50 yards or more (1968)…Still holds Houston career records for all-purpose yards per play (21.0 avg.) 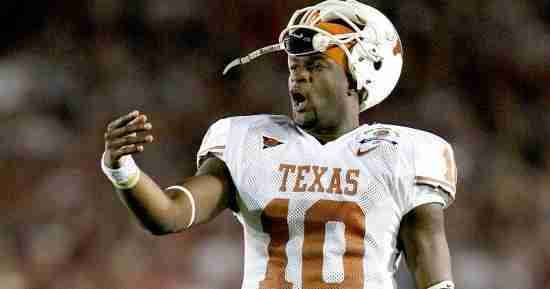 and yards per reception (21.9 avg.). 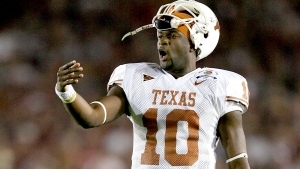 Vince Young, Texas-Quarterback - 2005 consensus First Team All-American and Heisman Trophy runner-up…2005 Maxwell and Davey O’Brien award winner who led Horns to the 2005 national title…2005 unanimous Big 12 Player of the Year and the first player in FBS history with 3,000 passing yards and 1,000 rushing yards in a single season (2005). Larry Blakeney-Troy (1991-2014) - All-time winningest coach in Sun Belt Conference history…Four-time conference Coach of the Year who led the Trojans to eight conference titles (5 – Sun Belt, 3 – Southland) and seven FCS playoff appearances in eight seasons…Led Troy to four bowl games, including wins at the 2006 and 2010 New Orleans Bowl. Jim Carlen-West Virginia (1966-69), Texas Tech (1970-74), South Carolina (1975-81) - Led teams to eight bowl games and 13 winning seasons in 16 years as head coach…1973 National Coach of the Year…Three-time Southwest Conference Coach of the Year…Coached Heisman Trophy winner George Rogers at South Carolina. Pete Cawthon Sr.-Austin College [Texas] (1923-27), Texas Tech (1930-40) - Led Tech to four Border Conference titles in 11 seasons at the helm…Led 1938 team to 10-0 regular season and the school’s first-ever Cotton Bowl appearance…Boasts highest win percentage (69.3) among Tech coaches with terms of three years or more. Dennis Erickson-Idaho (1982-85, 2006), Wyoming (1986), Washington State (1987-88), Miami [Fla.] (1989-94), Oregon State (1999-2002), Arizona State (2007-11) - Only Miami coach to lead the Canes to two national titles (1989, 1991) and boasts highest win percentage (87.5) in school history…Led teams to 12 bowl games and at least a share of seven conference titles…First coach to earn Pac-12 Coach of the Year honors at three different institutions. Billy Jack Murphy-Memphis (1958-71) - Winningest coach in Memphis history, including an unbeaten season in 1963…Named National Coach of the Year in 1963 by the Detroit News and Missouri Valley Conference Coach of the Year three-of-four seasons from 1968-71…Took Memphis to its first-ever bowl game and is a member of the Tennessee, Mississippi State, and Memphis halls of fame. Darryl Rogers-Cal State East Bay [formerly Cal State Hayward] (1965), Fresno State (1966-72), San Jose State (1973-75), Michigan State (1976-79), Arizona State (1980-84) - Took Fresno State to two bowl games...Achieved an unprecedented national ranking at San Jose State…Named Big Ten Coach of the Year in 1977 and National Coach of the Year by Sporting News in 1978…Won the Big Ten title in 1978. Ashley Ambrose, Mississippi Valley State-Defensive Back - 1991 First Team All-American and First Team All-SWAC selection…Named SWAC Defensive Back and Return Specialist of the Year in 1991…Led nation in punt returns during senior campaign. Archie Amerson, Northern Arizona-Running Back - Named First Team All-American in 1996…Finished as school’s all-time career rushing leader despite only playing two seasons (3,196 yards)…1996 Walter Payton Award recipient as Division I-AA’s most outstanding offensive player… Led NAU to its first-ever I-AA playoff appearance. Rick Bealer, Lycoming (Pa.)-Defensive Back - Two-time First Team All-American who led Lyco to a berth in the 1990 NCAA Division III National Championship…Ranks second in DIII history with 31 career interceptions and still holds DIII record with 48 punt returns in 1989 season…Four-time All-Middle Atlantic Conference selection, earning first team honors his last three seasons. Eddie Bell, Idaho State-Wide Receiver - 1969 First Team All-American and two-time First Team All-Big Sky selection…Ranks first in school history with 30 touchdown receptions and second in Idaho State annals with 2,676 receiving yards…Registered 3,341 all-purpose yards in career. Rennie Benn, Lehigh-Wide Receiver - Named First Team All-American in 1985…Currently ranks second in NCAA Division I-AA history in touchdown receptions (44), behind only Jerry Rice…Ranks seventh in Division I-AA history in career receiving yards (3,662). Bill Borchert, Mount Union (Ohio)-Quarterback - Two-time First Team All-American who led Mount Union to consecutive national titles in 1996-97…1997 recipient of Gagliardi Trophy and three-time First Team All-OAC selection… Still holds multiple NCAA, conference and school records and boasts 14,482 career passing yards. John Bothe, Augustana (Ill.)-Center - Named First Team All-American in 1988…One of three finalists for the 1988 NCAA Division III Player of the Year Award…Three-time First Team All-Conference selection (1986-88)…Helped Augustana to a 45-3-1 record. Carl Boyd, Northern Iowa-Running Back - Named First Team All-American in 1987…Selected First Team All-Conference and Offensive Player of the Year in 1987…In 1987, he was Conference Player of the Week four times…Two-time team captain…Totaled 2,735 career rushing yards and 1,987 receiving yards. Vincent Brown, Mississippi Valley State-Linebacker - 1987 First Team All-American, leading the NCAA in tackles in 1986 and 1987…Set NCAA All-Divisions record with 570 career tackles…Two-time All-SWAC selection who led MVSU in tackles his last three seasons. Joe Campbell, Middle Tennessee State-Running Back - Two-time First Team All-America selection (1990-91)…A three-time First Team All-Conference pick, he was named OVC Player of the Year in 1990…Led the team in rushing all four years. William Campbell, Western State (Colo.) - Defensive Back-Two-time First Team All-America selection (1978-79)…Set school record for interceptions in a season with seven in 1979…Led the team in tackles his senior year with 84. Vin Carioscia, Franklin & Marshall (Pa.) - Offensive Tackle-Two-time First Team All-American and First Team All-Conference selection (1981-82)…Named First Team All-ECAC in 1982…Four-year letterman and a three-year starter. Peter Catan, Eastern Illinois-Defensive End - Two-time First Team All-America selection (1979-80)…Member of the 1978 Division II National Championship team…Holds school record for quarterback sacks in a game (six), season (21) and career (47). Bruce Cerone, Emporia State (Kan.)-End - Two-time First Team All-America selection (1968-69)…Ranks second in NCAA Division II history in career touchdown receptions (49), fourth in career receiving yards (4,354) and ninth in receptions (241). Steve Cockerham, Akron-Linebacker - Two-time First Team All-America selection (1976-77)…Concluded career as the school’s all-time leader in tackles with 715…Led Akron to 1976 Division II Championship Game. Bruce Collie, Texas-Arlington-Offensive Tackle - Named First Team All-American in 1984…Led UTA to 1981 Southland Conference title…Three-time All-SLC selection…Played six seasons in the NFL with San Francisco and Philadelphia. Tom Collins, Indianapolis (Ind. )-Defensive Back - Named First Team All-American in 1985…All-time college football leader in career interceptions (37), representing all levels of the NCAA. Ray Condren, Gettysburg (Pa.)-Running Back - Two-time First Team All-American, All-ECAC and All-Conference selection (1983-84)…Finished second in rushing in Division III in 1984…Named ECAC Division III Player of the Year in 1984. Mark Cotney, Cameron (Okla.)-Defensive Back - Named First Team NAIA All-American and All-Conference in 1974…Amassed 132 career tackles and seven interceptions in two seasons at Cameron. Case deBruijn, Idaho State-Punter - Named First Team All-American in 1981…Twice led the nation in punting (1980-81) and was twice the runner up (1978-79)…Season average of 45.9 in 1981 is third all-time in I-AA. Parnell Dickinson, Mississippi Valley State-Quarterback - 1975 First Team All-American and Pittsburgh Courier National Player of the Year…Four-time All-SWAC selection and conference Player of the Year as a senior…Finished career as SWAC’s all-time leader in total offense (7,442 yards). William Dillon, Virginia Union-Free Safety - Three-time First Team All-America selection (1980-82)…Tallied 16 interceptions in 1983…1983 Black College Player of the Year…Two-time First Team All-Conference selection and Player of the Year (1981-82). Al Dorenkamp, Central (Iowa)-Linebacker - Named First Team All-American in 1974…Two-time First Team All-Conference selection (1973-74)…Captained Central to a perfect 11-0 mark and the Division III National Championship in 1974. John Dorsey, Connecticut-Linebacker - Named First Team All-American in 1983…Led the team in tackles from 1981-83…Two-time Yankee Conference Defensive Player of the Year (1982-83). Karl Douglas, Texas A&M-Kingsville-Quarterback - Led Javelinas to back-to-back NAIA national titles in 1969-70 as well as four consecutive conference championships…First player to be named most valuable back in the NAIA championship game in consecutive years. Chuck Downey, Stony Brook-Safety - 1987 First Team All-America selection…Recorded 239 tackles and 13 interceptions on defense…First player in Division III history to achieve 1,000 yards on both punt and kickoff returns in a career…Currently holds 12 NCAA Division III records and 23 school records. Keith Elias, Princeton-Running Back - Two-time First Team All-American (1992-93) and 1993 Ivy League Player of the Year…Princeton’s all-time leader in rushing yards (4,208) and rushing touchdowns (49)…Three-time All-Ivy performer who helped the Tigers to the 1992 conference title. Curtis Eller, Villanova-Linebacker - Two-time First Team All-America selection (1991-92) and was named National Defensive Player of the Year by The Sporting News in 1992…A three-time First Team All-Conference selection, he twice earned Yankee Defensive Player of the Year honors. Blake Elliott, Saint John’s (Minn.)-Wide Receiver - Two-time First Team All-American and winner of the 2003 Gagliardi Trophy…Two-time MIAC Player of the Year who holds NCAA All-Divisions record of 47 consecutive games with a reception…Led SJU to 2003 DIII national title and owns 29 school records. Richard Erenberg, Colgate-Running Back - Named First Team All-American in 1983…Broke 12 Division I-AA records…Selected as ECAC Player of the Year in 1983…All-time leading rusher in Colgate history…Two-time recipient of the Andy Kerr Award signifying Colgate’s MVP (1982-83). Jahri Evans, Bloomsburg (Pa.)-Offensive Lineman - 2005 First Team All-American who also earned Second Team All-America honors as a junior…Two-time Division II Player of the Year finalist and three-time First Team All-PSAC East selection…Helped Huskies to the 2005 PSAC East title and an NCAA playoff berth. John Fitzgerald, Central Oklahoma-Offensive Guard - First Team All-American who blocked for two 1,000-yard rushers in 1998…Led UCO to 1998 undefeated season and No. 1 final ranking…Only three-time All-American since UCO joined NCAA. London Fletcher, John Carroll (Ohio)-Linebacker - Two-time First Team All-American (1996-97) who holds school records for single-season (202 in 1997) and single-game (29) tackles…Two-time First Team All-OAC selection and 1997 OAC Linebacker of the Year…Led JCU to the 1997 NCAA Division III Quarterfinals. Bernard Ford, Central Florida-Wide Receiver - Named First Team All-American and 1987 Harlon Hill Trophy Finalist…Ranks in Top 10 of 14 UCF records, ranking first in receiving yards in a season (1,403), all-purpose yards per game (188) and average yards per catch in career (21.8). Duane Fritz, Chadron State (Neb. )-Punter - Named First Team NAIA All-American in 1975…Led NAIA II and the conference in punting in 1975…Averaged 42.3 yards on 65 punts in 1975. Rick Fry, Occidental (Calif.)-End - Two-time First Team All-American and All-Conference selection (1976-77)…Was the NCAA annual champion for receiving in 1976-77 and set four NCAA receiving records…Member of the Occidental Football Hall of Fame. Bob Gaddis, Mississippi Valley State-Wide Receiver - 1974 First Team All-American and Pittsburgh Courier National Receiver of the Year…Named 1970 NAIA Freshman of the Year en route to twice leading the NAIA in yards per catch (1971-72)…Three-time All-SWAC selection led conference in yards per catch all four years. Chris George, Glenville State (W.Va.)-Wide Receiver - Two-time First Team All-America selection and four-time WVIAC pick…Led GSC to Division II National Playoffs in 1993 and ‘94…Member of two conference championship teams and held nine national records by career’s end. Don Greco, Western Illinois-Offensive Guard - Named First Team All-American in 1980…Two-time First Team All-Conference selection – winning the conference’s Lineman of the Year award in 1980…A 1980 team captain, he was twice named Western Illinois’ MVP. Don Griffin, Middle Tennessee State-Safety - 1985 First Team All-American and Ohio Valley Conference Defensive Player of the Year…Three-time First Team All-Conference selection…Recorded 210 tackles, 13 career interceptions, and held school record for interceptions in a game (3). Boomer Grigsby, Illinois State-Linebacker - Three-time First Team All-American (2002-04) and FCS career leader in total (550) and solo (325) tackles…Only three-time Missouri Valley Football Conference Defensive Player of the Year in league history…No. 2 all-time in FCS averaging 12.50 tackles per game in career. Calvin Harrell, Arkansas State-Running Back - Two-time First Team All-American who led A-State to the 1970 NCAA College Division national title…Three-time First Team All-Southland Conference, three-time SLC champs (1968-70) and two-time Pecan Bowl champs…Holds school record for 100-yard rushing games (18). Ron Hausauer, Jamestown (N.D.)-Offensive Guard - Two-time First Team NAIA All-American and First Team All-Conference (1980-81)…Four-year letterman…Member of the Jamestown College Athletic Hall of Fame. Pat Hauser, Cal State Northridge-Offensive Tackle - Two-time First Team All-American and All-Conference selection (1982-83)… Four-year starter and letterman. Conway Hayman, Delaware-Offensive Guard - Named First Team All-American in 1970…Two-time First Team All-Conference selection (1969-70)…Led team to two conference titles and three Lambert Cup Eastern Championships. Bobby Hedrick, Elon-Running Back - Named First Team All-American in 1980…Ranked second in NCAA history in career rushing yards (5,604), among all divisions, at career’s end (behind only Tony Dorsett). Chris Hegg, Truman State (Mo. )-Quarterback - Named First Team All-American and AFCA Division II Player of the Year in 1985…Two-time conference Offensive Player of the Year (1984-85)…Still holds eight conference records. Bob Heller, Wesleyan (Conn.)-Center - Two-time First Team All-American in 1972-73… Two-time First Team All-ECAC performer who did not allow a sack during career… Key to 1972 offensive unit that set still-standing school record for 1,980 rushing yards in a season. Billy Hess, West Chester (Pa.)-Wide Receiver - 1988 First Team All-American and Harlon Hill Trophy finalist…1988 PSAC East Player of the Year and four-time All-PSAC receiver, who also earned all-conference honors as a defensive back in 1988…Led West Chester to PSAC title game appearances in 1986 and 1987. Lynn Hieber, Indiana (Pa.)-Quarterback - Two-time First Team NAIA All-America selection (1974-75)…Won the Division II Total Offense crown in 1975…Selected as ECAC Division II Player of the Year, First Team All-East and First Team All-ECAC in 1975. John Hill, Lehigh-Center - Named First Team All-American in 1971…Recipient of Football Roundup Magazine’s College Division Exemplary Player Award…Named First Team All-ECAC and New York Times All-East in 1971. Rene Ingoglia, Massachusetts-Running Back - Finished career ranked second all-time in FCS history in TDs (54) and as school’s all-time leader in rushing (4,624) and carries (905) among others…First UMass player to average more than 100 ypg rushing in career. Louis Jackson, Cal Poly S.L.O.-Running Back - Two-time First Team All-America selection (1978-80)…Member of the 1980 Division II National Championship team…Holds school records for yards rushing in a career (3,444), season (1,463) and game (267). Terron Jackson, Missouri Southern State-Offensive Tackle - Named First Team NAIA All-American in 1972…Member of school's Athletic Hall of Fame. John Jurkovic, Eastern Illinois-Defensive End - Two-time First Team All-America selection in 1988 and 1989…Two-time Gateway Defensive Player of the Year who led team to 1986 conference title…Set Gateway record with six sacks in a game and finished career as the conference’s all-time sacks leader (27). Ed Kelley, Hampden-Sydney (Va.)-Defensive End - Two-time First Team All-America selection (1974-75)…Three-time First Team All-Conference pick (1973-75)…Led the defensive unit that gave up only 10.8 points per game in 1975. Garry Kuhlman, Delaware-Offensive Tackle - Two-time First Team All-American and All-ECAC selection (1980-81)…His 1979 team led all Division I-AA teams in scoring with 35.5 points and 405.5 yards total offense per game. Al Lucas, Troy-Defensive Lineman - Two-time First Team All-American (1998-99) and winner of the 1999 Buck Buchanan Award as the nation’s top defensive player…Two-time First Team All-Southland who led Trojans to two conference titles…Three NCAA playoff appearances, including the 1996 Semifinals and the 1999 Quarterfinals. Steve McAdoo, Middle Tennessee State-Offensive Lineman - Two-time First Team All-America selection (1991-92)…Earned Third Team All-America honors by the Associated Press in 1990…Three-time First Team All-Conference pick. Gary McCauley, Clarion (Pa.)-Tight End - Two-time First Team All-America selection (1980-81)…Member of two conference title teams…Holds school career records for receptions (135) and receiving yards (1,736)…Four-year starter. Fran McDermott, St. Mary’s (Calif.)-Defensive Back - Two-time First Team All-America selection (1979-80)…Played in the 1981 Japan Bowl…Four-year starter and letterman…Holds school records for most interceptions in a career (21), season (8) and game (4). Bill McGovern, Holy Cross-Defensive Back - Named First Team All-American in 1984…Led the nation in interceptions (11) in 1984…Set Division I-AA career interception record with 24…Two-time All-ECAC performer (1983-84)…Named 1984 team captain. Steve McNair, Alcorn State-Quarterback - 1994 First Team All-American and the all-time passing leader (14,496) in the FCS…Finished third in 1994 Heisman Trophy voting and the only four-time SWAC Offensive Player of the Year in league history…1994 Walter Payton Award winner who led Braves to two SWAC titles and two NCAA playoff appearances. Tony Miles, Northwest Missouri State-All-Purpose/Wide Receiver - Two-time First Team All-American who led Bearcats to back-to-back Division II National Championships (1998-99) and four-consecutive MIAA titles…Set conference and school records for career receiving yards (3,890), receptions (235) and TDs (37). Carl Morris, Harvard-Wide Receiver - 2002 First Team All-American who holds virtually every Harvard receiving record, including career receptions (245) and TD receptions (28)…Ranks third all-time in Ivy history with 3,508 career receiving yards…Holds Ivy record for career 100-yard games (15) and 200-yard games (3). Robert Morris, Georgetown-Defensive End - Two-time First Team All-America selection (1973-74)…Member of the Georgetown Hall of Fame and the National Slavic Honor Society. Kenneth Murawski, Carnegie Mellon (Pa.)-Linebacker - Named First Team All-American in 1981…Named First Team All-Conference in 1981 and Second Team in 1980…Two-time team defensive captain…Totaled 243 career tackles and nine interceptions. Ed O’Brien, Central Florida-Placekicker - Named First Team All-American…UCF record holder for career field goals made (50), field goals attempted (77) and longest field goal made (55 yards)…Helped UCF to 1987 Division II Semifinals. Randy Page, Central Oklahoma-Quarterback - Named First Team NAIA All-American in 1983 and earned Second Team NAIA All-America honors in 1982…Led UCO to an NAIA National Championship in 1982…Broke 14 school records. Chris Parker, Marshall-Running Back - 1995 First Team All-America pick…Member of 1992 national championship team, leading MU back to national title game in 1993 and ’95 (national runner-up)…Recorded 31 games with at least 100 yards rushing en route to finishing career with 5,924 rushing yards and 68 touchdowns. Alonzo Patterson, Wagner-Running Back - Two-time First Team All-America selection (1981-82)…Finished fourth on the NCAA leading rusher list for all divisions in 1981, leading Division III with 1,487 yards…Three-time ECAC Player of the Year (1980-82). Ted Petersen, Eastern Illinois-Center - 1976 First Team All-America selection… Team captain who blocked for Nate Anderson, EIU’s first-ever 1,000-yard rusher…Became school’s highest-ever NFL Draft pick when he was selected 93rd overall (fourth round) in 1977. Martin Peterson, Pennsylvania-Offensive Tackle - Named First Team All-America, First Team All-Conference and First Team All-ECAC in 1986…His teams won three conference titles. Charlie Pierce, Central Florida-Punter / Placekicker - Named First Team All-America…Career record holder at UCF for punts (173), punt yardage (7,111) and points scored (297)… Helped UCF to FCS playoffs in 1993. Dave Pomante, Whitworth (Wash.)-Defensive Lineman - Named First Team NAIA All-American in 1981…Two-time All-District selection…Set school records with 20 sacks in a season and 35 in a career…Led team with 117 tackles as a senior. Tyrone Poole, Fort Valley State (Ga.)-Defensive Back - First Team All-America selection in 1994…Two-time Southern Intercollegiate Athletic Conference (SIAC) Defensive Player of the Year (1993-94) who led FVSU to two conference titles…Recorded 44 pass breakups and 17 interceptions, returning four for TDs. Gary Puetz, Valparaiso-Offensive Tackle - Two-time First Team All-America selection (1971-72)…Three-time First Team All-Conference selection…Made first team All-Conference as a placekicker as well in 1972…Earned team’s MVP award. Gerry Quinlivan, Buffalo-Linebacker - Named First Team All-American in 1984…Two-time First Team ECAC Upstate New York selection and team captain (1983-84)…Four-year starter and letterman…Two-time Most Outstanding Linebacker (1983-84) and named an NFF National Scholar-Athlete as a senior. Michael Renna, Delaware-Defensive End - Two-time First Team All-American, All-Conference and All-ECAC selection (1988-89)…Delaware’s Outstanding Senior Male Athlete in 1990…Finished career as the 10th leading tackler in school history with 205. David Rhodes, Central Florida-Wide Receiver - 1993 First Team All-American…Holds UCF records for receptions (213), receiving yards (3,618) and receiving TD (29) in career…Only Knight to record three seasons with at least 1,000-yards receiving and helped team to 1993 FCS Playoffs. Kirk Roach, Western Carolina-Placekicker - Three-time First Team All-America selection (1984-86)…Four-time First Team All-Conference pick…Holds five Division I-AA kicking records, 10 conference records and 18 school records…Missed only one extra point in four years. Harold Roberts, Austin Peay State-Wide Receiver - 1970 First Team All-American who boasts nearly every receiving record in APSU history, including career receptions (232) and reception yards (2,999)…APSU’s first four-time First Team All-OVC selection…Set NCAA record with 20 receptions in one game in 1969. 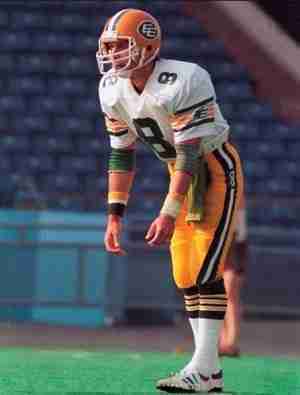 Bobby Saiz, Adams State (Colo.)-Quarterback - Named First Team NAIA All-American in 1989…Passed for 10,169 career yards and 87 touchdowns…Averaged 251 yards per game in total offense…Led team to No. 1 NAIA national ranking in 1989. Terry Schmidt, Ball State-Defensive Back - Named First Team All-American in 1973 when he set a single-season school record with 13 interceptions…Team MVP as a senior…Played in the Coaches All-America Game and the East-West Shrine Game. Larry Schreiber, Tennessee Tech-Running Back - Named First Team All-American in 1969…Set an NCAA record for most career rushes with 877…Set six conference records…Currently ranks second on the conference all-time rushing list with 4,421 yards. Steve Schubert, Massachusetts-Wide Receiver - Named First Team All-American in 1972…Averaged 81.9 yards receiving per game in 1972, which ranks fourth on the school record list…Holds school record for average yards per catch in a season with 20.1 in 1972. Joe Skladany, Lafayette-Linebacker - Named First Team All-American in 1981…Four-year starter who never missed a game…Boasts school records for career tackles (532) and blocked kicks in a season (3)…Team captain and two-time Team MVP who led nation’s second-ranked defense in 1981. Ed Smith, Bethel (Kan.)-Wide Receiver - Named First Team NAIA All-American in 1985…Three-time First Team All-Conference selection (1984-86)…Holds 13 school records…His 47 career touchdown receptions were two short of the national record. Paul Smith, Gettysburg (Pa.)-Return Specialist - Two-time First Team All-American as a kick- and punt-returner…Set three NCAA records, including still-standing record of 527 all-purpose yards in a game (1999)…1999 Centennial Conference Co-Player of the Year and four-time All-CC First Team selection. Tom Stenglein, Colgate-Wide Receiver - Two-time First Team All-America selection (1984-85)…Two-time First Team All-ECAC pick (1984-85)…Colgate’s all-time leader in receptions in a game (12), season (67) and career (144). Freddie Thomas, Troy-Defensive Back - Two-time First Team All-America selection (1986-87) and helped lead Troy to the NCAA Division II National Championship in 1987…A two-time First Team All-Conference pick, he was named team captain in 1987. Markus Thomas, Eastern Kentucky-Tailback - Finished career ranked third all-time in FCS history in rushing (5,149)…Two-time Ohio Valley Conference Offensive Player of the Year who led team to two conference titles…52 career rushing TDs. Brad Tokar, Westminster (Pa.)-Running Back - Named First Team Little All-American in 1990…Two-time First Team NAIA All-America selection (1988, 1990)…Led Westminster to two NAIA Division II National Championships…Westminster’s all-time leading rusher with 5,269 career yards. Jay Wessler, Illinois College-Running Back - Named First Team NAIA All-American in 1979…Three-time member of the NAIA District All-Star Team…Three-time team MVP (1978-80) and Illinois Athlete of the Year (1979-81). Tim Whelan, Tufts (Mass. )-Running Back - 1976 First Team All-American who set school single-season rushing records in consecutive seasons…1976 ECAC Division III Player of the Year and George H. “Bulger” Lowe Award as New England’s best player for all divisions…234 rushing attempts in 1976 is school record. Gary Wichard, LIU-C.W.Post (N.Y.)-Quarterback - Named First Team All-American, ECAC Player of the Year and team captain in 1971…Played in the 1972 Senior Bowl…Set school records in career passing yards (5,373), touchdown passes (41) and total offense (5,642). Mike Wiggins, Iowa Wesleyan-Punter - Named First Team Little All-American in 1987 and an NAIA All-American in 1986 and 1987…Named National Punting Champion for the NAIA in 1987. Jerry Woods, Northern Michigan-Defensive Back - Two-time First Team All-America selection and All-Conference pick (1987-88)… Returned 89 punts for 1,129 yards, a 12.6 yard average…Returned kickoffs for 1,475 yards, a 24.9 yard average and current school record. John Zanieski, Yale-Middle Guard - Named First Team All-American and First Team All-Ivy League in 1984…Selected as the team’s MVP in 1984…Finished second on school’s quarterback sack list with 21. Ross Fortier-Minnesota Moorhead (1970-92)-School's all-time winningest coach…Led his team to seven postseason playoffs and nine conference championships…Led 1981 team to unbeaten regular season and number one ranking in the final regular season poll…Member of the NAIA Hall of Fame.